This frozen ice-cream style dessert will set quite hard so allow to soften for about 20 minutes before scooping. Use an ice-cream maker if you have one. If not, you’ll need a large strong plastic container with a lid to fit in your freezer. Make up the Muscle Mousse as per pack instructions, using almond milk in place of the water. If using an ice-cream maker, pour the Muscle Mousse into the bowl and churn until nearly frozen, adding the chocolate chips when nearly ready, then pour into a plastic container with a lid and freeze until required. If you don’t have an ice-cream maker, pour the Muscle Mousse into a large strong plastic container with a lid and freeze for 30 minutes. Remove from the freezer and stir well with a fork, then return to the freezer. Repeat after another half an hour or so, breaking up the crystals around the edge and whisking well with the fork. Stir in the chocolate chips. Return to the freezer and repeat after a further half an hour then smooth over the top and freeze until required. The ice-cream will be quite hard when frozen so remove from the freezer and allow to soften slightly for about 20 minutes before scooping. 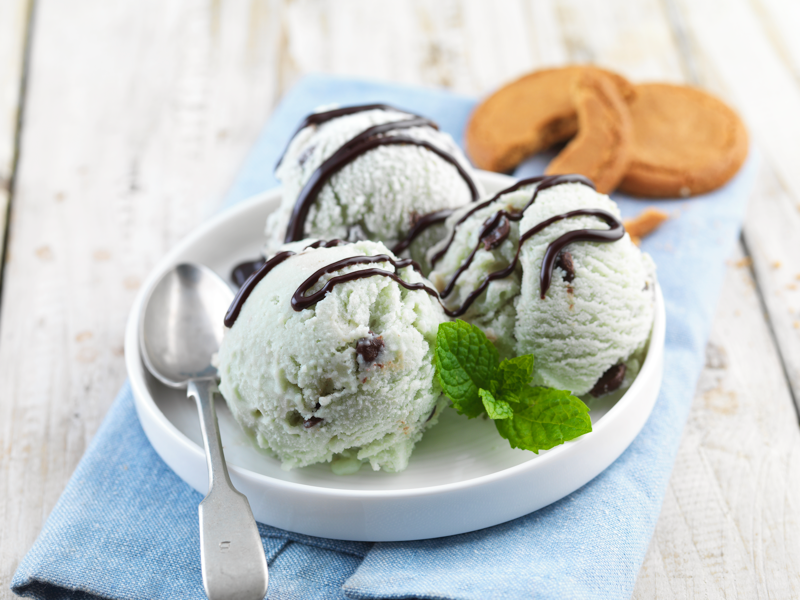 Serve with the chocolate sauce drizzled over the top and a mint leaf for garnish if you’re feeling artistic!